- INDE – Gujarat - One of India's most historic landmarks is to be digitally recorded by a group of Scottish experts in an effort to preserve its every detail. 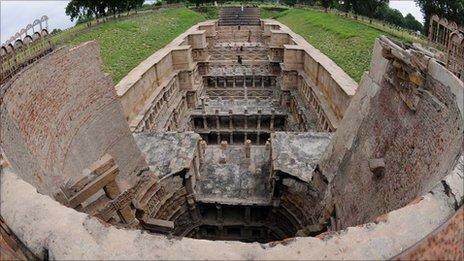 The team, from Glasgow School of Art and Historic Scotland, will scan the Rani Ki Vav Stepwell in Gujarat. The site, which dates back to 1050, is made up of decorated stepped terraces descending into the ground. The project is part of a global programme by the design team to record sites of historical significance. Rani Ki Vav has only been fully excavated in the past 50 years and is currently on the Unesco tentative list to be considered for World Heritage Site status. - INDE - Sisupalgarh - Archaeologists at the Deccan College here have found lateritic blocks, which form the outer enclosing walls of earthen mounds that bear similarity to the earthen stupas associated with early Buddhism, during excavations at Sisupalgarh, an early historic city on the outskirts of Bhubaneshwar. These findings, published in a recent report by the institute, strengthen thebeliefof ignificant Buddhist activity in and around Sisupalgarh during the 3rd century BC. Excavations in Sisupalgarh began in 2005 in a joint venture directed by R K Mohanty of the department of archaeology, Deccan College, and Monica L Smith of the Cotsen Institute of Archaeology at the University of California, Los Angeles, with cooperation from the Archaeological Survey of India. - USA – San Francisco - The Presidio, site of the first Mexican settlement in San Francisco, will be transformed into an educational walking trail. The announcement came during the Fourth Annual Redmond Kernan Lecture Series held on Nov. 17, 2010 at the Presidio Officers Club when four archaeologists disclosed their findings of a one-time valley known as El Polin. Discovered a couple hundred feet east of the Presidio beneath four feet of landfill dating back hundreds of years, lies this one-time valley. The El Polin Loop, as it is being called today, will be a classroom where students get to use the landscape to interpret some of the artifacts found. El Polin is going to be restored back to its natural habit. The valley is a riparian area, and the planting of indigenous plants and the removal of the fill is already underway. The restoration of the wetlands will be reminiscent of The Presidio’s Mexican era.This era of “El Presidio” is often the most overlooked and misunderstood time at The Presidio. The historic findings included a Spring Box that drew water from a spring to create a pool that helped to filter sediment, cool food items, and offer protection against animals. 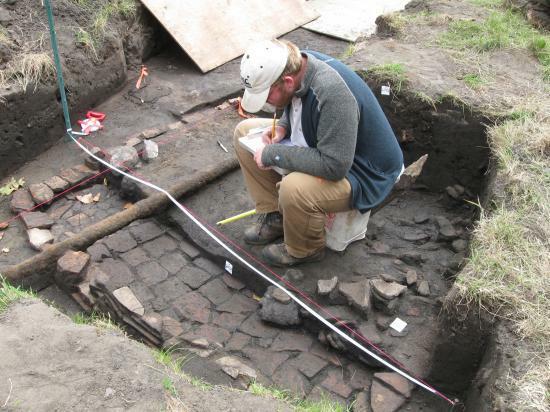 They also found a brick clamp, a type of brick-making furnace that cooked from the inside out — an ancient technique dating back to Roman times. A third discovery was a large waste pile — most likely the wasted clay tiles that inevitably occurs when making bricks in a brick clamp. This seems to be the first physical evidence of Mexican settlements outside The Presidio. The El Polin settlements were on the main trail that extended from El Presidio to Mission Dolores. These were the only established settlements at the time, which was around the 1810’s. Under Mexico rule, El Presidio housed the Mexican governor of California. At this time you were either a soldier or a missionary. Both were very structured societies, and to live outside of those establishments was unheard of until then. - ROYAUME-UNI – Richmond - Work has been temporarily halted on an unpopular playground after historical artefacts were discovered at the dig site. An archeological dig carried out near Crane Park’s Shot Tower – close to the site of a new planned playground – unearthed a number of items believed to date from the 18th and 19th century. Among the items found last Saturday were floor tiles believed to have been part of former houses around the Grade II listed tower, glass and a ceramic jar. The tower was built in 1826 and was used for making lead shot. Molten lead would be carried to the top of the tower then poured through a copper sieve and dropped into a water tank at the bottom. - ROYAUME-UNI – York - A 400-year-old carving of a merman, discovered among the remains of a 17th century merchant ship in Dorset, will have its first public outing as part of York Archaeological Trust’s Shipwrecks exhibition, which opens in York on Monday. The 1.5 metre-long baroque-style carving was found among the remains of the Swash Channel wreck, which was originally discovered off the Dorset Coast in 1990. 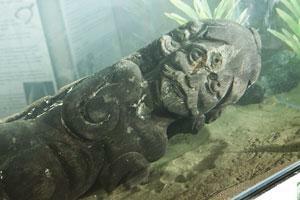 The carved wooden merman will sit in water in the display case which will form the first stage of the conservation programme, helping to flush out harmful salts that have leached into the wood following 400 years immersion in the sea. The exhibition, at the trust’s DIG centre until September, will enable visitors to explore the underwater world of marine archaeology and find out how shipwrecks are discovered, recovered and preserved for future generations. The exhibition will also include other finds from the Swash Channel wreckage such as a swivel gun and an apothecary jar. There will also be gunpowder containers from an Elizabethan wreck from Alderney; examples of expanding bar shot; and a mysterious rescued object which can only be seen with X-rays.